Hi, everyone. I had the honor of receiving the "7 Facts Award" award from two people. A million thanks to both of you for passing this award to me! 2. 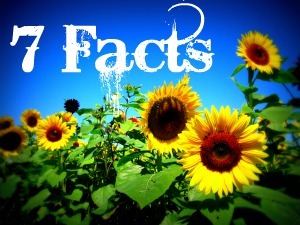 Post seven random facts about yourself. 3. Pass on the award along to 15 other worthy bloggers. I have a habit of giving nicknames to all the books I own. I love pizza & spaghetti. I sometimes read children's fiction. I'm 19 and I don't want to grow up.